SBI Clerk Notification Has Been Released For 8301 Vacancies (Recruitment of Junior Associates - Customer Support & Sales). Preliminary Examination will be conducted tentatively in the month of March / April 2018. We (BankingCareers.in) are team of experienced staff, trainers and retired bank staff. In 7 years, over 2.62 lakh candidates used our books. You will study only 1100 important questions. This book is based on repeated question types asked in past 3 years. 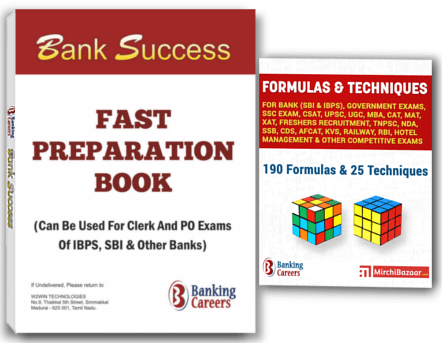 For these questions, you will find easy solutions by experienced trainers and retired bank staff. To study quickly, you will find solution after each question. You can complete this book in approximately 4 weeks or even faster. This book contains all major sections: Numerical Ability (Quantitative Aptitude), English Language (Verbal & General English), Reasoning Ability (Logical Reasoning), Computer Aptitude (Computer Awareness) and General Awareness. Using this handbook, in 2 hours you can study 190 formulas and 25 techniques. You will find examples for easy understanding. You will get time for revision and practice.How to order?Use the order form below. We will send your books through courier or post. = Rs. 375 Rs. 295.